Above: Ken Mayer and Tarak Kauff join Irish activists at a Palestine solidarity vigil in Limerick March 30. Monday and Tuesday, April 8 and 9, are hereby declared “Get Ken and Tarak Home” days. 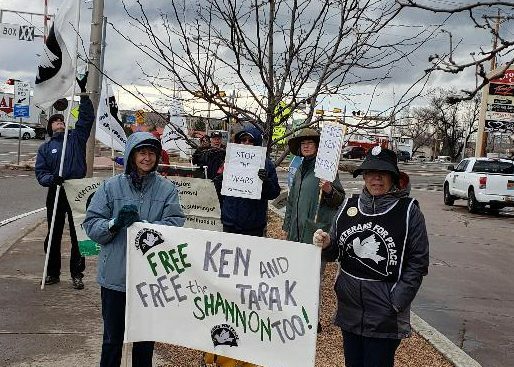 We are asking people to concentrate calls, letters, and visits to Irish Embassies and Consulates, the State Department, and elected officials on these days so that these institutions experience a flood of support for Tarak and Ken and protest against U.S. military flights through Shannon. Letters to the editor of your local paper are also important. We should be demanding that being forced to stay in Ireland amounts to punishment before being convicted. We should stress that it is damaging to their health, their finances and their families. And, of course, that they were only arrested because they were trying to stop the illegal U.S. military flights through Shannon that bring troops and weapons through meant for illegal wars in the Middle East that have already killed up to a million children, and displaced millions of refugees. Click on “Action Points” for details on who to call, and click on “Talking Points” for Ed Horgan’s detailed notes about why Ireland should not be allowing the U.S. flights through Shannon. Under the “Resources” link are samples of letters to the Irish Embassy, Secretary of State Pompeo, and to local newspaper editors. 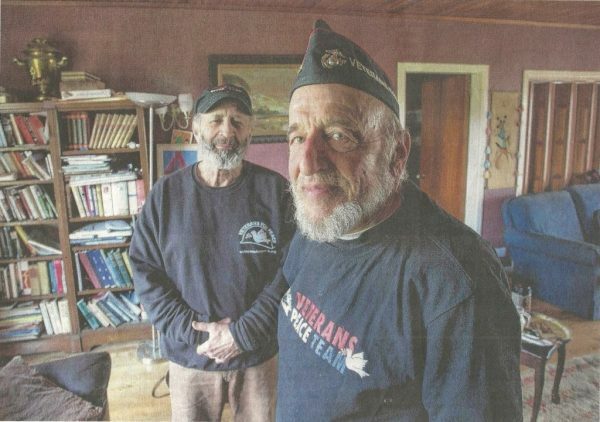 Veterans for Peace members, Tarak Kauff and Ken Mayers were arrested protesting at Shanon Air Force Base. They were held without bail until an appeal was heard in the High Court before Judge Robert Eager who granted bail, but they are still in Ireland. 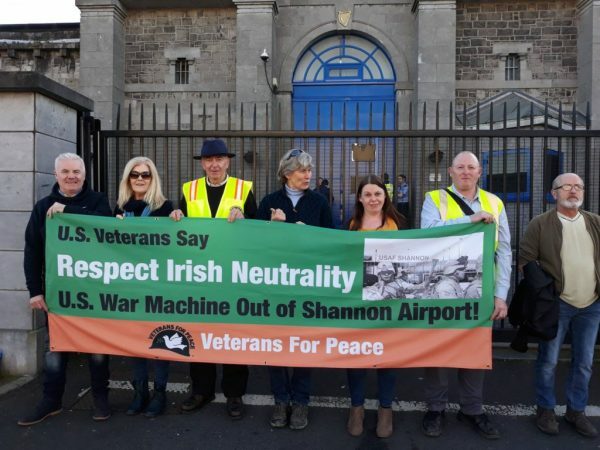 They were part of a group of seven US Veterans for Peace took part in a protest against US Military Base at Shannon Airport on Sunday, March 17. Tarak and Ken were arrested at Shannon Airport on March 17 for entering the airfield to inspect and investigate an OMNI Air International plane on contract to the U.S. military. Tarak Kauff and Ken Mayer after their release. Photo published in the print edition of the Irish Times March 30. Tomorrow, April 3, is the next hearing before a judge in the Ennis District Court, where they were twice refused bail. They will submit a motion to have the trial moved to the Circuit Court in Dublin. This will accomplish two things: It will guarantee that they get a jury trial, rather than being tried before a single judge, and it will move them out of County Clare, where Limerick Airport and the U.S. military flights are a major economic driver. Vigil outside Limerick Prison March 27 for Tarak Kauff and Kan Mayers displaying the larger version of the banner that Ken and Tarak took onto the airfield at Shannon. After being released on bail, Kauff and Mayer settled in at Irish activist Sean Clinton’s home. They have access to their phones and emails and are seeing all the solidarity actions that took place on their behalf–New York, Washington (twice! ), San Francisco–letters from all over, and more. They are very moved by the support that has swelled up. And they are very happy to be able to communicate directly with friends and family. The Irish Times printed an article about their experience in prison, which failed to note why they were on the tarmac at Shannon Airport or to mention the illegal U.S. military flights at all. Several letters have been sent to correct the record. The two also spoke on John McDonagh’s show on WBAI-FM, Radio Free Eireann. John has been covering the issue in every show since the March 17 arrests, and you can find interviews with Ed Horgan, Ellen Davidson, and today’s show in the WBAI archives. Ken and Tarak are also getting back on the streets. They attended a vigil in Limerick in support of Palestinian rights (Ken and Tarak have twice traveled to the West Bank with VFP Veterans Peace Team delegations). “We see the connection between the U.S. warplanes refueling at Shannon Airport to bring troops and munitions to wage death and destruction in the Middle East for the past 18 years and the Israeli occupation and oppression of the Palestinian people – an occupation supported and encouraged by almost four billion of US tax dollars as well as US political cover every year,” said Tarak. Their passports have been confiscated and they have been told they must stay in Ireland for the trial. Their allies are organizing support for a campaign to bring them home in the next weeks. In the meantime, they will be housed and fed by great allies on the ground over in Ireland. 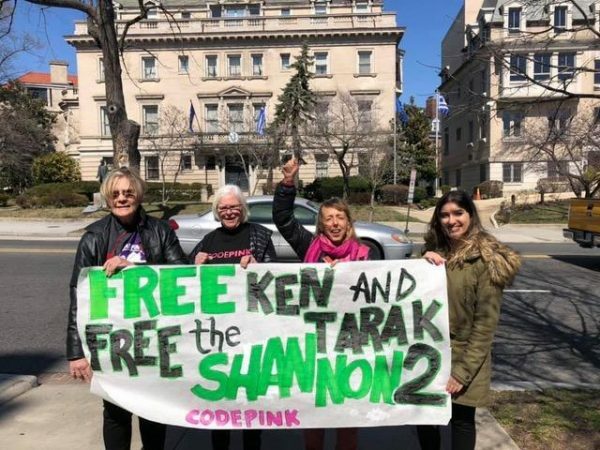 CODE PINK Free the Shannon Two, Washington, DC, March 19. 1. Neutrality: Irish Government leaders since 1939 have stated that the Irish government has been and still is pursuing a policy of neutrality or “military neutrality”. Under international laws on neutrality, this means that the Irish Government is obliged to comply with international laws on neutrality. So, when are the war crimes trials to begin? THAT is the question!